Users without a complete 4K system today can save money with INOGENI 1080p60 HDMI converter and purchase a 4K firmware upgrade when they want. The real cost of building a 4K system includes monitors, cameras, cables, strong computer processors and 4K software. Buying a 4K converter before you need it may be premature. If you want to unlock 4K functionality of your device by buying the 95$USD upgrade fee, click the next link. 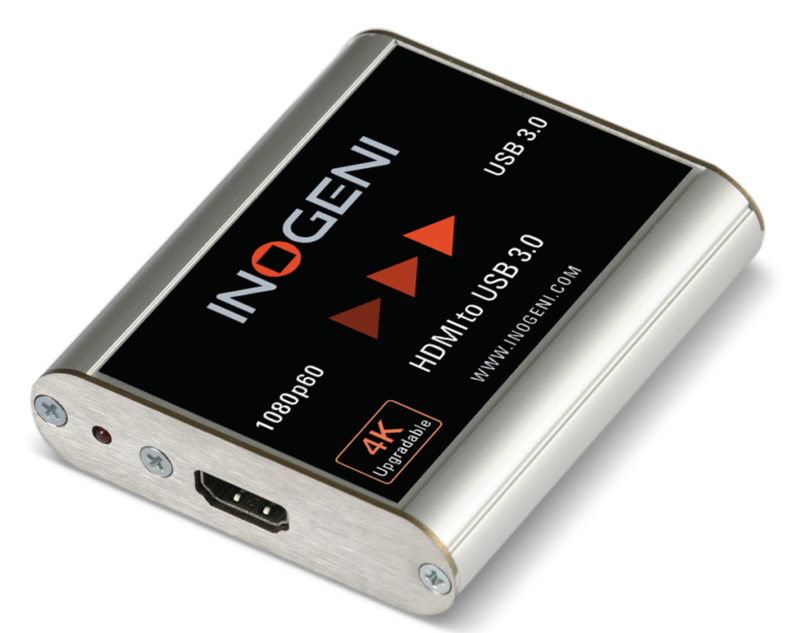 The INOGENI HD2USB3 Converter requires no drivers and works on all motherboards and USB 3.0 chipsets. It is the most reliable and convenient PC input to capture uncompressed video with audio from your camera's HDMI output for recording, editing, videoconferencing and streaming applications. It is compatible with Windows, Mac OSX, Linux, and Android operating systems. The INOGENI HD2USB3 features a single HDMI input and USB 3.0 output, and supports SD and HDTV video formats, up to 1080p60, as well as most computer graphic formats. Compact in size and powered directly from a USB 3.0 port, the converter is a practical and easy-to-use USB 3.0 capture solution. It is compatible with Windows, Mac OSX, Linux, and Android operating systems, and is UVC-compliant, so it will work with all DirectShow compatible software. The HD2USB3 supports 1080p resolutions up to 60 fps. HDMI capture to USB 3.0. Field upgradable to 4K at minimal fee ($95). Supports 1080p, 1080i, 720p, 480p, and 576p video formats. Supports 1920x1200, 1280x1024, 1280x960, 1024x768, 800x600, 640x480 graphic formats. Up to 1080p at 60 fps. Powered from a USB 3.0 port. A USB 3.0 cable is included. HDCP Copy Protection INOGENI will not decrypt BD/DVD movies, satellite/cable receivers or other encrypted sources.